Arts under assault by provincial legislators with national reach seems to be a rich, perennial American sport. It’s hard to quantify the value of funding, bureaucratic assistance and the value that a leader’s embrace has on artistic endeavour until you’ve had it and let it slip away. We let quite a lot slip away recently, didn’t we? Most of the effects are forthcoming and will be enveloped with cocktail of hard feelings, loss or worse. Let us take stock of how we book acts by drafting the actions of larger arts organizations. Karl Berger and Ingrid Sertso returned to Florida for several weeks in March 2017 after a Master Artist In Residency at Atlantic Center For The Arts in 2015. They will likely be back again next year. Roedelius was a late add to this year’s Big Ears Festival in Knoxville, a springboard for his first U.S. dates in six years. These confluences between the larger and smaller organizations can also buttress the lateral collaborations, such as this very event. Functionally Literate and The Drunken Odyssey are two word-driven analogs to Civic Minded Five, delivering thoughtful events and punching above their collective weight. Together we present this evening as a public outreach in a well-known commercial and cultural waystation. Functionally Literate and The Drunken Odyssey are the tent that delivered The Promethean Conduit. It combines experimental electronic music with a trans-humanist narrative told by two voices. Written by Teege Braune, and produced by Jared Silvia, the piece will feature live readings and live music in a collaborative performance. The Stardust event will be the premier performance of this project. In addition to the listed narrative voices, add Tony Miracle and Exatari as the evening’s electronics wranglers. The Promethean Conduit is simile to John King’s Pink Fire Revue when that words and synthesis project ran eleven months back as an In-Between Series event at Gallery At Avalon Island. The Claudia Quintet made it here in 2015 due to a touring grant in Florida from Chamber Music America. That exposure included St. Petersburg and now the ensemble returns to the Composers Forum at University of South Florida. We’ll see them again because they liked you the last time around and wanted to play for us again- without the grant check. The energy of support for the arts can become contagious and regenerative. The Claudia Quintet are in their nineteenth calendar year following their genesis as a weekly residency trio at alt.coffee in Manhattan’s East Village. Before their expansion to a quintet they had already set the tone as a genre-jumping crew by presenting chamber compositions with improvisation via accordion, double bass and drums. 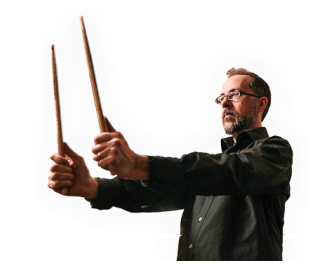 Drummer John Hollenbeck is the straw boss, composer and sole survivor of that original trio. The accordion and double bass are still there, long since augmented by clarinet/tenor saxophone and vibraphone. That makes for a non-idiomatic frontline of vibraphone, reeds and accordion as the melodic instruments. New music- that’s what the scribes call it. We’re beholden to that ideal, if anything. There are eight releases to choose from in the Claudia Quintet catalog. A unifying feeling auditioning their output is that they are an electrified jazz group, post-early fusion era. The reality is that Claudia Quintet is an acoustic ensemble channeling unexpected timbre choices among the instruments. Combined with modern recording techniques and influences from 1970’s and 1980’s Minimalist compositions, post-rock indie bands and, to our ten ears, early 1970’s Frank Zappa instrumental-centric bands, they are players retraining listeners to what the boundaries of jazz are. Their artist page at Cuneiform Records posits the idea of Claudia Quintet being regarded as post-jazz. The limber ensemble touring our way includes Chris Speed on clarinet and alto saxophone, Matt Moran on vibraphone, Red Wierenga on accordion, Drew Gress on double bass, and leader Hollenbeck on drums. Take part in the Timucua instant arts community created at each event by appearing willing – described by composer Anthony Braxton as the “friendly experiencer.” This time we’re at Stardust. Bring cash and cards. We’d be grateful for a donation to our causes. Stardust Video & Coffee will feed, speed and grog you. We’ll see you there. Tags: Civic Minded 5, Claudia Quintet, cm5, Jared Silvia, Promethean Conduit, Stardust, Teege Braune, Timucua Arts Foundation. Bookmark the permalink.